Summer is coming to a close. School is back in session in Atlanta and I am itching to wear my cute sweaters and boots for fall (even though Fall doesn’t really happen until end of September—oof!). Also, call me basic, but I am looking forward to my first PSL of the season. TBH, I’m not crazy about summer. I don’t like wearing shorts (I know I’m a monster), I don’t like the heat, I don’t like the bugs. BUT—there are two things I will give to summer: Swimming (<3!) and THE FOOD! Summer is my favorite season for food. It’s the most plentiful time of year. Tomatoes, corn, tons of fresh berries, peaches, zucchini, grapes, cherries, bell peppers, figs, cucumbers— the list goes on and on! 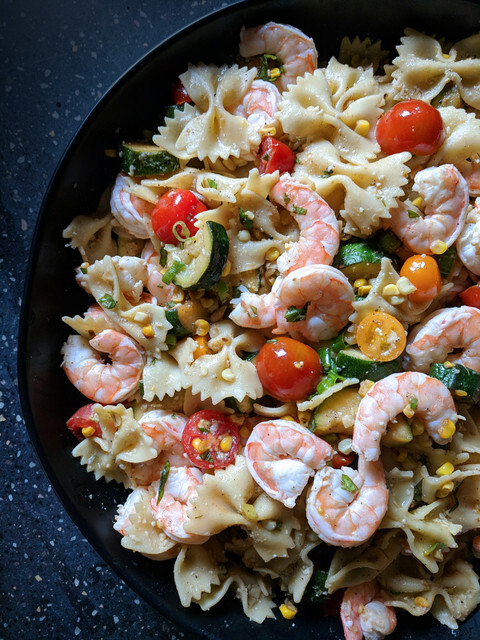 If there is one recipe of mine that celebrates the bounty of summer, it’s this summer pasta. I love this pasta so much, it is so simple, and it’s so easy to customize if you want! Don’t like shrimp? Swap for chicken! Don’t eat meat? Leave it out! Don’t have tomatoes? Swap for bell pepper, or add in extra bell pepper! 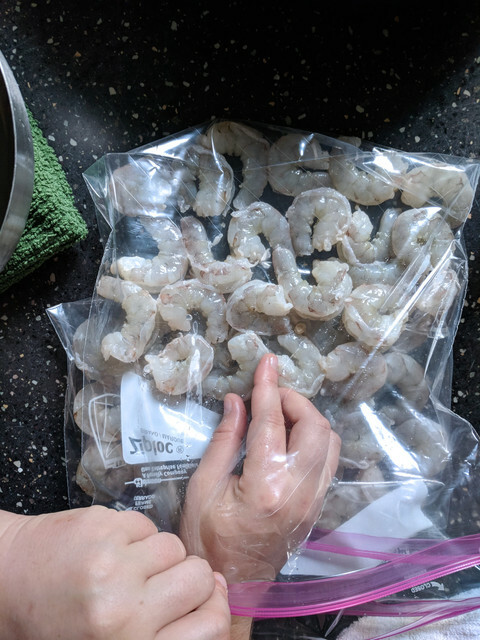 I used my sous-vide tool to make cooking the shrimp effortless and tidy. I love my Joule—it’s the slimmest (I keep mine in my cutlery drawer) and IMO, the most beautiful sous-vide tool on the market. 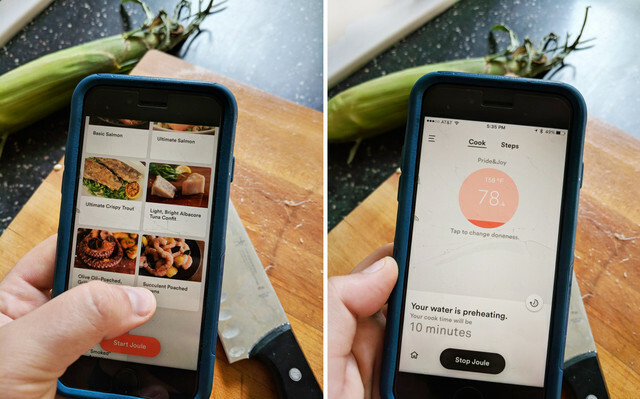 I love the ease of the app which takes all of the guess work out of sous-vide cooking. If you are not familiar with sous-vide cooking, it is simply the process of gently cooking food in a plastic bag in a water bath at a low temperature over time. With Joule, you can even use just your common Zip-loc bags from the grocery store (which are BPA free). As a technique, sous-vide’s advantages lie in the consistency and the fact that it is virtually impossible to overcook food when you cook sous-vide. My personal favorite is that I literally just plop the bag in the water bath, hit the timer and forget about it. I don’t need to stand over the stove, fussing over whether my food is cooked through or not, and it frees me up to focus on the other elements of my recipe! And no mess! Seriously, WIN-WIN-WIN-WIN! You can get your own Joule from chefsteps.com — FYI, this is not a sponsored post. 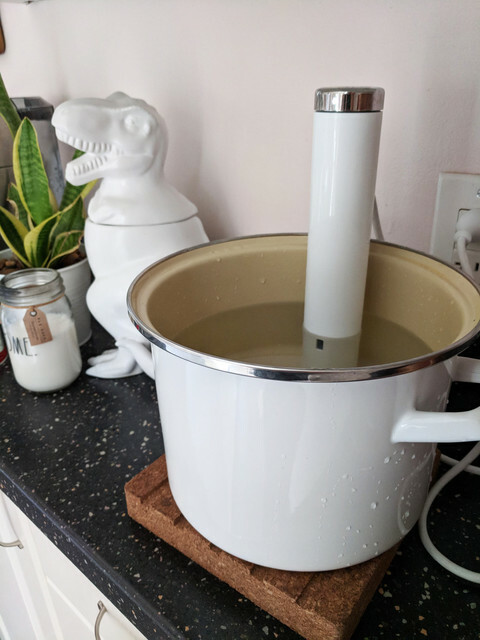 I just love my Joule so much and want everyone to experience effortless, healthy, tidy cooking to help make their lives easier and cooking more enjoyable! Love y’all! Also–another heads-up: I love using the EZ-Peel, deveined gulf shrimp from Sprouts Farmer’s Market. It makes preparing this dish even more effortless. 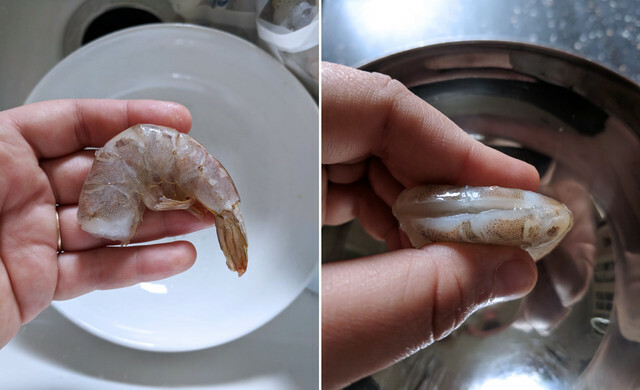 All you have to do to clean the shrimp is remove the outer shell (it slides right off), you don’t have to worry about deveining! Boom! Another great thing about this dish, aside from being so stinkin’ easy, is the fact that it tastes good warm/fresh, as well as chilled! It’s a great picnic recipe to have on hand! Without further a-do, here’s the recipe! Put a cast-iron skillet on medium-medium high heat and add 2 tablespoons of olive oil to the pan. Heat olive oil and then add the minced garlic, cooking slowly until fragrant. Then add zucchini, a healthy pinch of salt and pepper, and cook until golden brown. Meanwhile, put a large stock pot filled with water on high heat. Add salt, a little olive oil and bring water to boil. Once water is boiling, add pasta and give it a stir to keep pasta from sticking together. Reduce to simmer and cook 8-10 minutes or according to package instructions. Drain and set aside. Once the zucchini is cooked, remove it from the pan and set aside. Then, add 2 more tablespoons of olive oil to the pan and then add corn. Keep the pan on medium heat, stirring occasionally until the corn develops a golden, roasty color. While the corn cooks, slice the cherry tomatoes in half, and slice the green onions in 1/4″ slices. Set aside. Cook shrimp using a sous-vide tool or by sauteeing in a non-stick pan. Set aside. 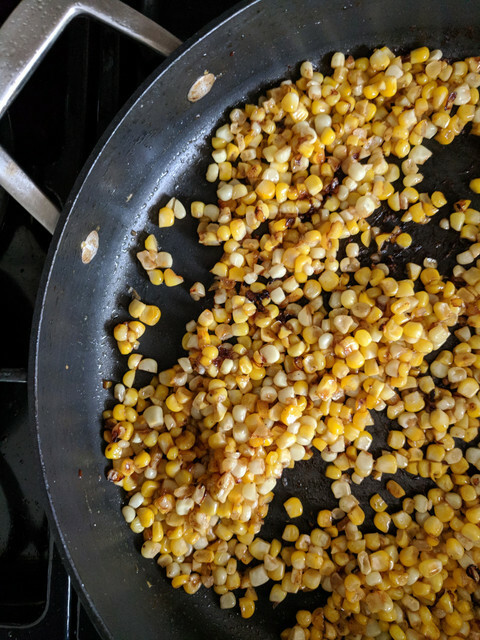 Remove corn from pan. 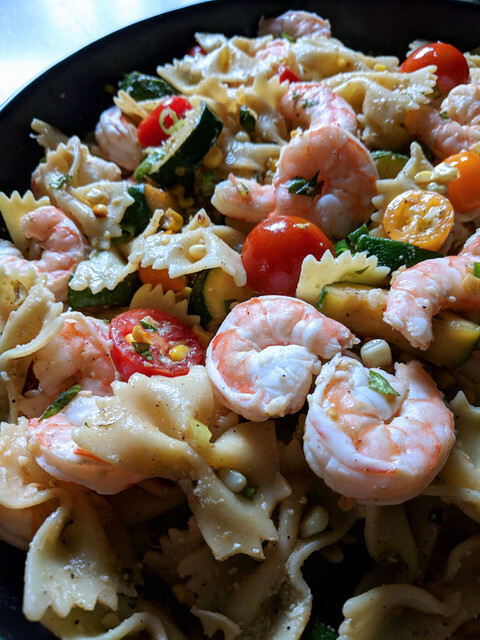 Combine all of the cooked veggies, pasta and shrimp together and toss. Season with salt and pepper to taste and then add grated parmesan/romano cheese and toss. Serve immediately or chill and serve later! What’s your favorite summer recipe? And what are you most looking forward to this fall?